Swami Bhuteshanandaji, the 12th President of the Ramakrishna Math and Ramakrishna Mission, was loved and respected for his saintly personality, his profound scholarship, and his lucid exposition of the scriptures. As a Vice-President, and later as President of the Order, he traveled extensively to propagate the message of Vedanta as propounded and practically demonstrated for the modern world through the live and teachings of Sri Ramakrishna and Swami Vivekananda. He visited the Vedanta Centre of Japan ten times, staying there for about 75 Japanese students of Vedanta. Many of them who attended his classes all the years, later taped, transcribed, and sent the scripts to Belur Math. The devotees of Japan not being well conversant with English and also with Indian religious traditions, Revered Maharaj's talks were conditioned by the circumstances there. Though these talks were published serially in Vedanta, the journal of the Ramakrishna Vedanta Centre, U.K., Revered Maharaj initially rejected the idea of bringing the out in a book form, for he felt that the lectures were superficial. Impressed by reading the lectures in Vedanta, many, however, persisted in their request to Revered Maharaj to publish them as a book. When he was in the hospital in 1998, Revered Maharaj heard the entire script read out to him, and suggested corrections at some places. This editing continued till his last day at Belur Math. When he was hospitalized on the 5th August 1998, from where he never returned, Revered Maharaj was dictating the English Translation of the aphorisms. The last aphorism he translated was the 62nd. 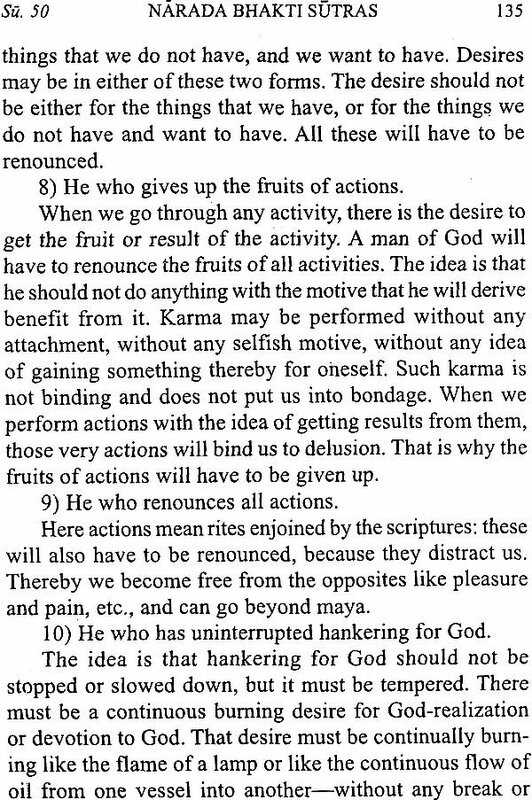 Sub-sequently, the remaining 20 aphorisms were translated using Revered Maharaj's own words from his commentary by one of his trusted assistants in literary activities. This book is now before the reader. What Revered Maharaj felt to be 'superficial' has appeared to us to be a work of great value. The readers, we trust, will find a study of this book highly rewarding. The best and easiest path to attain God in this age, according to Sri Rama-Krishna, is the path of devotion as taught by Narada. Narada Bhakti Sutras is a complete and thorough guidebook for all sincere seekers of God. Taking us from the first steps of our spiritual ascent, it leads us gently and firmly till we reach the summit. Again and again Narada urges us to strive for divine bliss and supreme love, leaving aside all distractions of this world. By singing the glories of God, meditating on Him, and constantly fixing our minds on Him, realization is not far off. Narada assures us that if we persevere in our practice, the Lord will certainly manifest himself to us in all His glory-not only in our hearts but also as a living presence in all beings. With examples from the lives of previous lovers of God, Narada inspires us to go on and on. How to develop love for God? This is an important question. The answer is both easy and difficult. Easy because we often hear that if we pray to God, offer worship to Him, and try to lead a pure and good life, we can have love of God. Though it looks so simple, it is easier said than done. When we try to put these ideas into practice, we find great difficulty. First of all, it is difficult for us to understand what love of God means. We have an idea of love in our relation toward earthly things and living beings. We love our parents, children, and so on. The husband loves his wife and the wife, her husband. There is then the love for wealth, reputation, power, and such other things. We can understand all these types of love. But to understand what love of God means is difficult. The reason is, we do not I as to what kind of relationship we should have with God since we do not have any experience of that sort of relationship as we have with people here. Everything we love is concrete and can be perceived through our senses. God, however, is not of that type. The other reason is that we do not begin with realization of God. It is all more of imagination than reality when we think of love of God. Now we feel that imagination cannot be entertained without the basis of realization or experience. Therefore there is difficulty in our concept of love of God. How to develop love God? The difficulty is obvious, but then, those who have experience in this show us the way we can achieve the goal. For instance, Sri Ramakrishna says: 'A devotee must assume toward God a particular attitude.' One must think of God as one's father, or mother, or child, and so forth. That sort of superimposition can be of some help. We have experience of love for all these earthly relations, and that is to be superimposed on God. It is said in the scriptures: 'You are my Father, my Mother, my Friend, and Beloved. You are my wealth, my scholarship, my everthing Humanbeings can have that sort of conception with regard to God: that is, to think that He is our every-thing in this world. In the beginning, however, it becomes only a sort of preparation-a sort of imagination. Later on, with the gradual deepening of feeling, this very imagination becomes realization. What is imagination today will become realization tomorrow. That is how love of God can be cultivated. This love of God is called bhakti or devotion, and the path to attain God through bhakti is called Bhakti Yoga. In the bhakti aphorisms (sutras) of Narada, we find that God is not defined fully: 'This devotion is the supreme love towards something or somebody. The devotional path is not easy because nothing great can be achieved easily. Is it so easy to attain God who is the most precious possession in life? Practice is necessary. 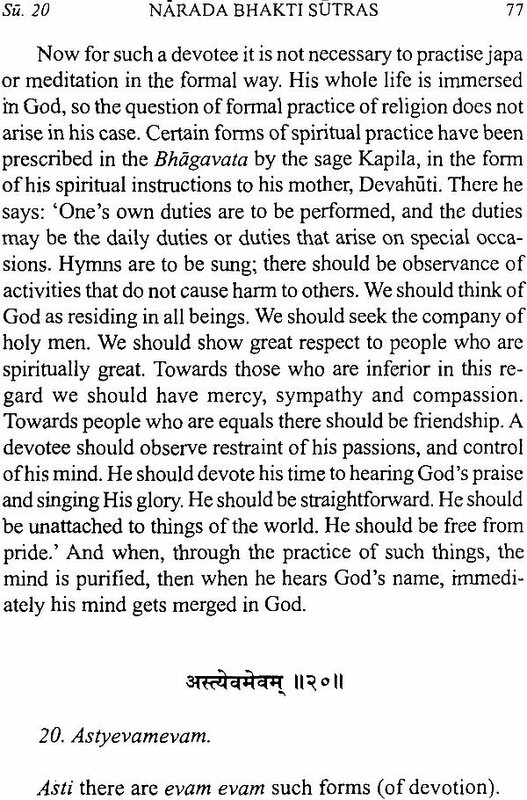 As Sri Ramakrishna used to say, one has to 'repeat God's name and sing His glories, and keep holy company'. 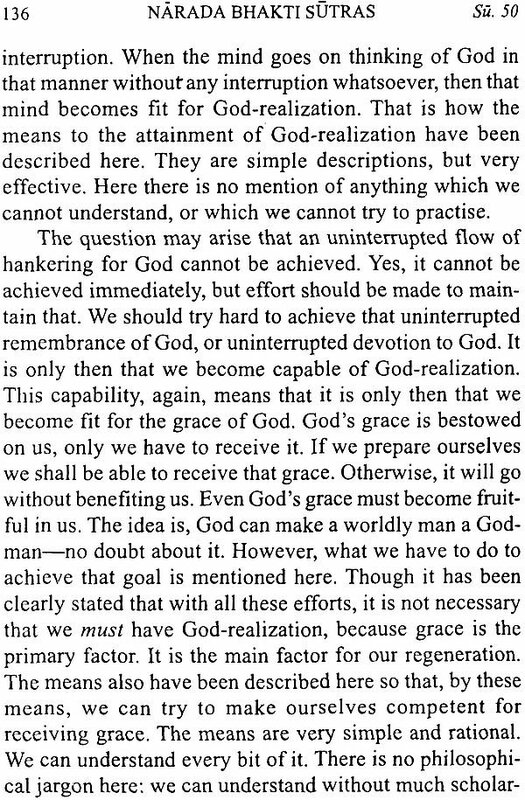 These are preparatory steps to devotion. Ritualistic worship, prayer and so on are called vaidhi bhakti or the way of devotion as prescribed by the scriptures. Developing love of God through preparatory devotion can be likened to children playing with dolls. When little girls play with their dolls, some of the dolls become their sons and daughters, and thus they establish a relationship with them. They feed them, dress them, put them to bed, and even cry if they break. We will have to continue our preparatory devotion till we feel God's living presence. Even though we may assume some relationship with God and try to pray, worship and so on, there are several obstacles in the path-both internal and external. There are internal problems like lust, greed, etc., while lack of proper place, help, cooperation, and so on are external obstacles. Sri Ramakrishna said that all problems cease when love dawns in the mind of a devotee. The tiger of love swallows lust, anger, jealousy, and so on. In other words, intense love for God removes all obstacles from the path of God-realization. We say that there are terrible obstacles in this world. Such obstacles, however, are not in the world but they are in the mind. When love of God dawns in the mind all obstacles disappear. How can we achieve this intense love for God? It can be achieved by regularly serving God with love and sincerity. The mind of one who leads a pure life gradually becomes tinged with divine love. Then, no worldly obstacles can stop that person's growth, as household duties could not stop the gopis from going to meet Sri Krishna. The Bhagavata gives this example. While the gopis were busy with their household work they heard the sound of Krishna's flute coming from the forest. That call of God was irresistible. The gopis immediately forgot their work and rushed towards Krishna. The very call lifted their minds from their household duties. It is mentioned in the Bhagavata that once a gopi was confined to her room. She deliberated and realized that her body was the obstacle preventing her from going to see Krishna. So, she gave up her body and united herself with the Lord in a subtle body. Even her body could not stop that union! That is called real love. Sincere love for God removes all obstacles from the life of a devotee. One day, M., the recorder of The Gospel of Sri Ramakrishna, asked the Master as to what one should do if the wife becomes an obstacle to his spiritual growth. The Master told M. to convince such a wife initially. What if she threatens by speaking things like committing suicide? The Master said: 'Give up such a wife if she proves an obstacle in the way of spiritual life.' 1 Later on, Sri Ramakrishna added: 'If a man has sincere love for God, then all come under his control-the king, wicked persons, and his wife. Sri Ramakrishna gave a few suggestions so that the devotees may be free from obstacles in the spiritual path. One is prayer. If one prays to God sincerely, God removes all obstacles and makes everything favourable. The Master's second suggestion is to have the company of holy persons. He is a holy man who lifts others' minds to a higher realm of spirituality. Holy persons are exemplars of holiness. Their lives vindicate the existence of God; otherwise, human being could not have faith in spiritual life. The third suggestion is to live in a solitary place occasionally. Sri Ramakrishna gave an example: Trapped by the fisherman's net, some fish hide in mud and think that they are safe. They do not realize that the fisherman will slowly pull the net and catch them, and they will lose their life. Just as fish are caught in the net, our souls are bound by the world. So, we should go into solitude and think about the goal of human life. If we experience that the world is not real is full of misery, we will not be attracted to it. Spiritual disciplines remove our attachment for the world and create in us a longing for God. Longing is the only thing needed. 'Longing is like the rosy dawn. After the dawn out comes the sun. Longing is followed by the vision of God,' says Sri Ramakrishna. Lastly, one must remember that this path of devotion is for everyone. Anybody can practice it. Even the vilest man can start with it, and gradually improvement will take place. The nature of that love is that it not only purifies the person who loves, but the conception of his or her object of love also undergoes change. That purification, or that transformation, goes on from the lowest rung of the ladder to the highest. This is the beauty of the path of devotion. The Narada Bhakti Sutras is a simple text on devotion. It contains 84 sutras or aphorisms. 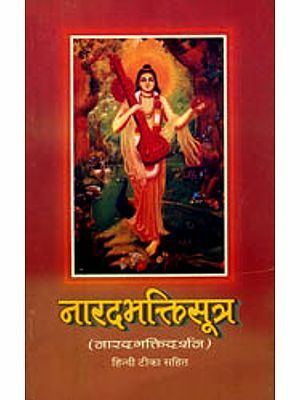 The date and authorship of the book are not quite clear, though it is considered that sage Narada is the author of this book. Sage Narada is well known for his devotion. 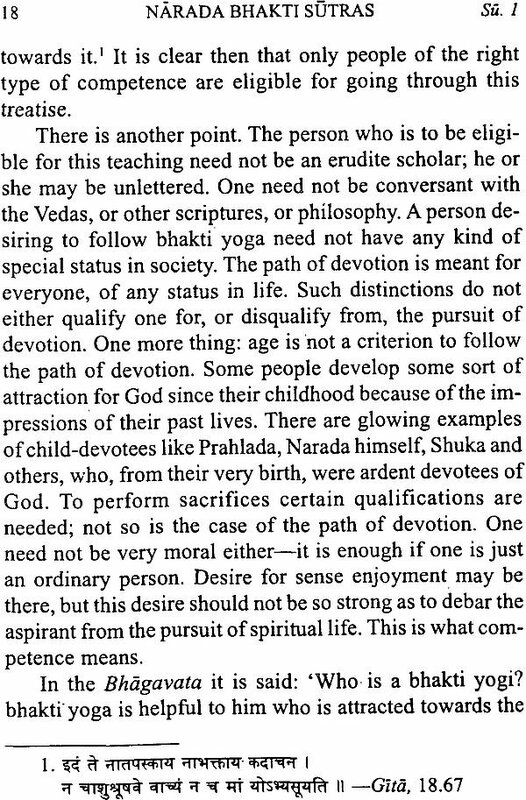 Even Bhagavan Sri Krishna himself extols the qualities of Narada in the Santiparva of Mahabharata. The lord repeatedly says there that Narada is worshipped everywhere, by everyone. Though not much is known about the life of Narada, the Bhagavata (1.5 and 1.6) gives a brief account of his childhood. About the father of Narada, we do not find any mention made; but, it is said that his mother was employed in a brahmin's house as a maidservant. I t was a time when many saints had gathered in that brahmin's house as his guests and Narada was serving them. Narada looked after the comforts of the guests and also listened to their discourses. The guests also were very pleased with Narada as he attended on them with much devotion, though only a body of five. S they taught him the the path of devotion. In the meantime, Narada's mother died of snake-bite. Early one morning, while it was still dark, she was going to milk the cows of the Brahmin. One the way, she was bitten by a snake, and expired. After the passing away of his mother, who was the only earthly link with whom Narada was connected, he felt completely freed of his obligations, and left the house of the Brahmin. He retired into a forest and there yearned and prayed for the vision of God. God appeared before him and Narada was very happy to see God in his vision. But soon, the vision disappeared. Narada was sorry to be deprived of that experience. As he was crying and yearning for its repetition, he heard the voice of God telling him: 'You will not see Me anymore in this life. Now that you have had my vision, your life will be full of joy; go about singing the glory of God.' Thereafter, Narada moved around the world, singing God's name and teaching people the path of devotion, or the path of love. This is what gave rise to the Narada Bhakti Sutras. What is a sutra? A sutra is an aphoristic or cryptic statement, which contains a vast idea within a few words. There is a verse in the Padma Purana which says that a sutra is one which, in a few words of no ambiguity or repetition, expresses in gist form a vast ides; such a sutra cannot be substituted nor does it contain nay fault. A sutra also means a thread- thread that binds the entire text together. 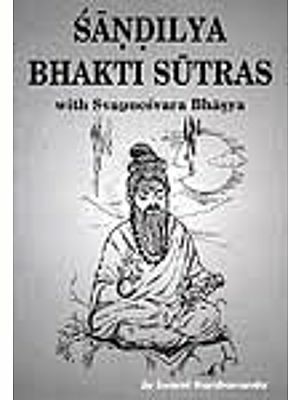 Extremely important spiritual ideals were written in sutra form so that they could be easily memorized Bhakti Sutras also, the entire system of devotional path is explained in just 84 sutras. In the following pages, we shall make a study of the path of devotion according to Narada. During my visits to the Vedanta Centre of Japan, I had given talks upon request to the devotees there about the Narada Bhakti Sutras. 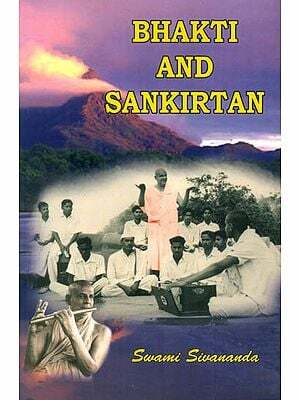 Those talks were transcribed from tape and published as a serial in the Vedanta, the quarterly journal of the Ramakrishna Sangha, published from our U.K. Centre. A thoroughly revised version, with translation of original sutras and notes, is placed before readers now.